SCOPE OF WORK: Schedule A. Design & Development of a new website for Bradley Johnson Attorneys with an emphasis on a high impact, visual presentation, landing page display and improved search engine optimization. Custom design & mock-up process to ensure the right look and feel for this new site. No canned templates. 20 pages of content integration with calls to action where appropriate. Editable site content so client can update and create new pages, add products, attachments and documents (data sheets). Easy to use document and image management site wide. Website Pages & modules – Multiple page creation & refinement such as contact/quote forms, highlighting awards, customer testimonials, emphasis on Boeing, Military and FAA/PMA approval where applicable. Reviews, FAQs & Testimonial content to present value proposition to prospects. We also recommend direct Avvo integration/linkage to build trust quickly. Form builder to allow creation of ad-hocs forms as needed and change current forms and fields without requiring a developer. Assist with additional tasks not identified as requested on an hourly basis after site is deployed, set-up and ready for usage. Security plugin for managing baseline website security and alerting. New auto-generated XML site map for feeding Google new pages. Google analytics integration to track visitors. Advanced security modules to help protect against modern threats. Training & Documentation for day to day operation of the website and the things you will change the most. Includes: End to End Content Migration, Setup and Integration. Plugins & Hosting: Site functionality is dependent on a few plugins that carry an annual cost. Gravity Forms ($30), Advanced Custom Fields ($30) and a series of image compression, (to make managing images and formats easier), SEO tools and security plugins. Avg is $199/annually. Client will move content over to the new system after FDG Web sets up all new design views and functionality to allow the content to be created/posted/migrated. 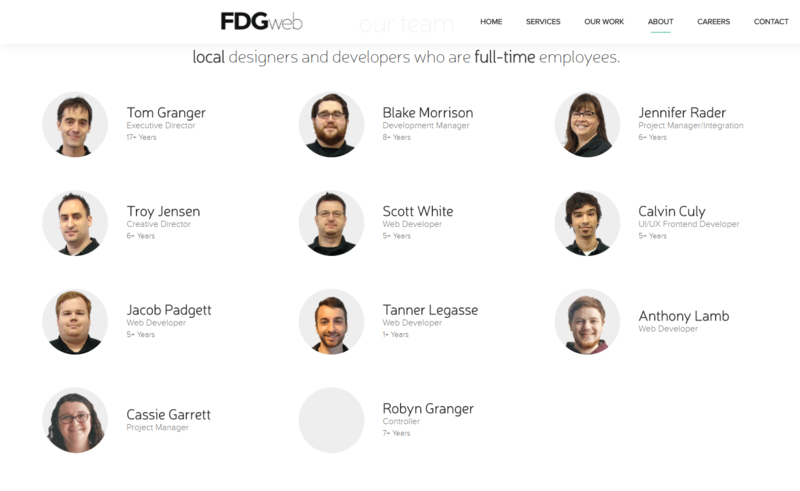 FDG Web will assist client on an on-demand basis for new content not budgeted into the development phase. Design process will be for main pages, content pages and catalog view pages. Terms: 50% deposit to start. Progress billing on Net 15. All hours to be billed back against deposit and accounted for in spreadsheet format. Timeline – Sites like this realistically average around 60 - 90 days of design & development time - with content changes often being the portion of the project that can take the most time if you are writing/editing new content. We can use existing content and but a better "polish" on it to help speed the project up.